We combine the data rich measurements from our advanced real-time UV-VIS sensors with our custom AI algorithms to develop site specific calibrations for our clients. These custom calibrations enable us to provide real-time detection of parameters, such as BOD, that would traditionally be left to the laboratory. 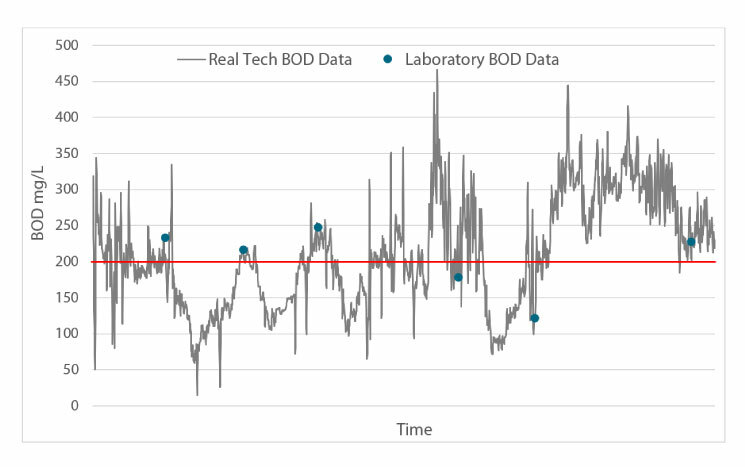 Our Liquid Ai data analytics services provide ongoing calibration health monitoring to ensure the real-time BOD results are as accurate and predictive of the lab as possible. The service enables continuous calibration improvements to be made as water quality composition changes or new contaminants are introduced. We ensure reliability and trust in the results, so our clients can make confident, informed decisions to improve their plants processes. The longer our systems are installed, the smarter and more insightful they become with our Liquid Ai service. Biochemical Oxygen Demand is an important water quality parameter because it provides an index to assess the effect discharged wastewater will have on the receiving environment. The higher the BOD value, the greater the amount of organic matter or “food” available for oxygen consuming bacteria. If the rate of DO consumption by bacteria exceeds the supply of DO from aquatic plants, algae photosynthesis or diffusing from air, unfavourable conditions occur. Depletion of DO causes stress on aquatic organisms, making the environment unsuitable for life. Further, dramatic depletion can lead to hypoxia or anoxic environments. BOD is also used extensively for wastewater treatment, as decomposition of organic waste by microorganisms is commonly used for treatment. Regulations for BOD will vary by country and region. In general, maximum allowable concentration for direct environmental wastewater discharge fall around 10 mg/L BOD and maximum allowable concentrations for discharge to sewer systems around 300 mg/L BOD.